Walid Hamud-Ahmed with his family and the Gold-Headed Cane. 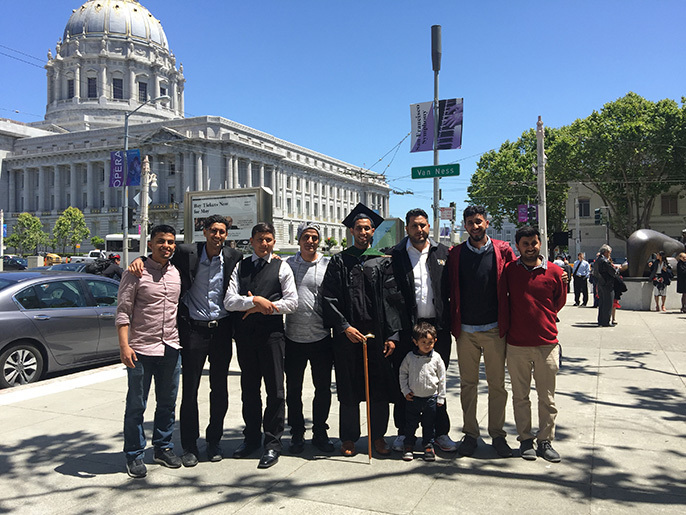 He may have just earned his medical degree, but newly minted UCSF graduate Walid Hamud-Ahmed has spent his lifetime cultivating the skills to serve as a doctor in his community. One of six children of Yemeni immigrants, Hamud-Ahmed credits his medical school experience with providing him with his second-best education about life. His first: working nights, summers and weekends at his family’s Fresno convenience store. “If you can do a 12 to 16-hour shift in the store, you can certainly study six hours a day,” he said. The Fresno native graduated from UCSF last month with one of its highest honors: the Gold-Headed Cane, given to graduating students who are voted by the peers to represent the qualities of scholarship and devotion to the patient that characterize the true physician. He is now back in his hometown for a residency as an emergency room doctor at Community Regional Medical Center, Fresno. Every weekend and summer vacation, he and his brothers worked at the store from sun-up to sundown, running the cash register, sweeping and stocking shelves. “That drilled in us a lot of patience and perseverance, as well as how to deal with people and solve problems,” he said. Hamud-Ahmed’s parents, Ali Hamud and Nor Mohamed, grew up in Yemen, and both left elementary school to help their families tend cattle. The young couple moved to the U.S. not long after they were married. They settled in Fresno, where they lived in a one-room trailer and worked in the fields until they saved enough to buy the store and a modest home. In short order, they had six children – all sons – and built the market into a reliable business concern. Then, one morning when Hamud-Ahmed was 11, his father was killed in a car accident on the way to work. His mother, who had a third grade education and barely spoke English, was left on her own to care for the boys, ranging in age from 4 to 19. “There was a big decision we had to make as a family,” said Hamud-Ahmed. The brothers kept to their word: one is completing a law degree at Berkeley, another is a Cal graduate and yet another is studying business at Fresno State. Hamud-Ahmed graduated from Fresno State, before going on to UCSF. There, he found a community of researchers that pushed him to take risks. His studies focused on gun violence and the role that emergency rooms and physicians can play to halt cycles of violence. The statistics are stark: someone who is survives a gunshot wound is five times more likely to die in the next five years as someone without that history, due to a combination of factors that include violence, poverty and socioeconomic health disparities. There are interventions and programs that can help reduce the risk, but they generally fall outside the scope of health care providers’ field of knowledge. “There is a huge potential to create interventions that could prevent further violence,” said Hamud-Ahmed. Also while at UCSF, he helped start the Yemen Relief Project, a student-led organization that is raising money to fight cholera and malnutrition. A young Hamud-Ahmed with uncle Muthana, big brother Ghasan, uncle Bin Ali, and father, Ali Hamud, at Grant Market, the family store. With his long list of academic and personal accomplishments, Hamud-Ahmed could be off to a residency at a prestigious hospital anywhere. But he has chosen to go back to his hometown. He says his familiarity with the community will help him to be a better doctor. “You ask someone where they live and you know exactly that part of town. You know the social determinants, the risk factors, you know the high school their kids go to. You eat at the same restaurants,” he said. Many of his patients – or their parents and friends – may remember him from his days at the store. Except instead of giving change and checking prices, he’s suturing wounds and setting broken arms.